I was in Syria in 2009, and celebrated my first Middle Eastern Ramadan there, and my last, most probably, in the Damascus that I knew. My next Middle Eastern Ramadan was in Palestine, where we were working in refugee camps across the West Bank and in East Jerusalem. I saw people dressed in their smartest clothes herded together and watched over by soldiers bearing guns. I then went on to my third Middle East Ramadan, in Jordan, where we were working with Syrian refugees living inside and outside of the refugee Camps. People hospitable as we entered their Camp with our special security passes; sharing their food, their tea, their water. Whether they were eating or not. For the refugees we work with Ramadan is many times a time of violence, heightened tensions, increased security measures. A time of desperate sadness for the brother, father, sister, mother, friend, who has been killed by war. A time of urgent frustration at the lack of choice, and sense of emasculation at living in a world where one’s status is ‘refugee’. For this Ramadan it is humanity that I hope for; compassion for all of our fellow souls. Ramadan Kareem to my brothers and sisters everywhere. Ahmad, 26, is a Palestinian born and raised in Shuafat, a Palestinian refugee camp, located on the outskirts of Jerusalem. His childhood and daily living under occupation has shaped him to become the person he is today–compassionate, reflective, and driven with a passion. “Shuafat didn’t use to have checkpoints when I was young,” Ahmad explained. “Then one day, the Israelis stationed a couple soldiers at the entrance. Over time, some boulders were moved in front of the soldiers to ‘protect’ them from rocks being thrown at them. A few soldiers eventually turned into an army truck, and a permanent gate was built. I now go through this checkpoint at least twice a day for work,” Ahmad said. Throughout our evening together, Ahmad continued to share his experience living under Israeli occupation with me. “The Israelis did bad things, but the Palestinians also did bad things,” Ahmad said somberly. “If you see those things with your own eyes, then you’ll believe me. Don’t blindly believe what the books tell you. Everyday is war here; it’s just hidden,” Ahmad went on. While this young Palestinian lives daily amongst grave injustice, prejudice, and racism, his calm composure and determination for peace struck a chord in me. Ahmad grew up with his younger brother and his mother in Shuafat refugee camp. His father died when he was little. His mother, who works as a special education teacher, became the primary caretaker and breadwinner of the family. Ahmad laughed as I told him that he was one of few Arabs I know with a small family. “Yes, only one brother.” He said with a grin. While Shuafat refugee camp started with roughly 3,000 people in 1965, it holds more than 24,000 refugees today according to UNRWA statistics. 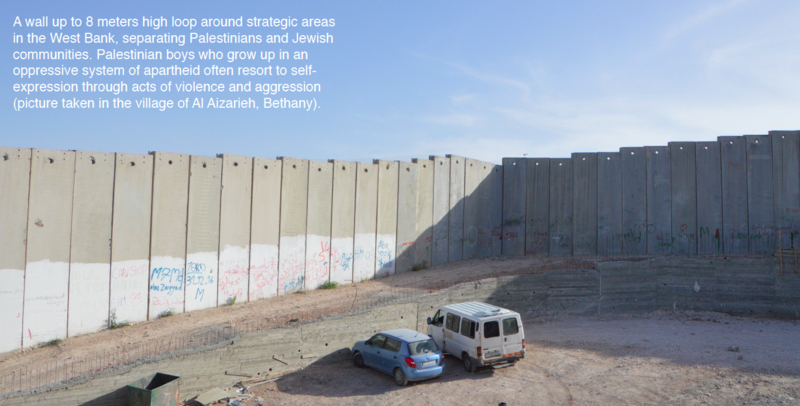 With a rapid population growth, refugees in Shuafat not only face challenges such as restricted mobility, overcrowding, and limited resources, but also the perils of living under Israel’s militarism. According to Ahmad, the police are often sent into Shuafat in disguise, dressed in civilian attire to obtain information and arrest anyone for the slightest misconduct. “Palestinian boys who threw stones used to get arrested for just a few days. Now they are kept in prison for years.” Ahmad said. Throughout our discussion, Ahmad patiently described to me what life as a Palestinian is like. For instance, Ahmad alerted me that Palestinians have two types of identification cards– green and blue. Unfortunately, neither of them grants full citizenship. Ahmad carries a blue ID—following his mother’s status—which grants him greater freedom of mobility beyond the occupied areas compared to those holding green IDs. “Palestinians with green IDs cannot work in many places or buy property,” Ahmad explained. As we walked along the road, Ahmad continued to highlight the tangible, yet overlooked, ways that Palestinians are ostracized in society, including different license plates, government buildings, schools, and the prominent separation wall surrounding the West Bank that divides Israelis and Palestinians. When enclosed by a wall created to evoke fear, isolation, and hatred, capoeira became the medium that Ahmad uses to cut across the aisle, bridging seemingly irreconcilable differences. 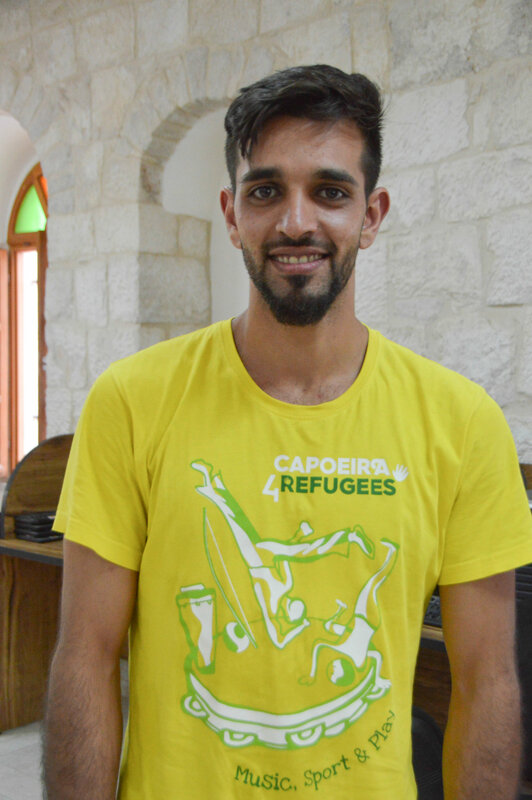 “I didn’t really know any Jewish people until I played capoeira with them,” Ahmad said. Since the majority of people who were first introduced to capoeira in this context were Israelis, many capoeira workshops and events are held in predominantly Jewish areas, leading Palestinian capoeiristas to come together over their shared passion for this sport. While walking along Jaffa Road, a major street in Jerusalem, Ahmad suddenly stopped and pointed to an old building to our right. 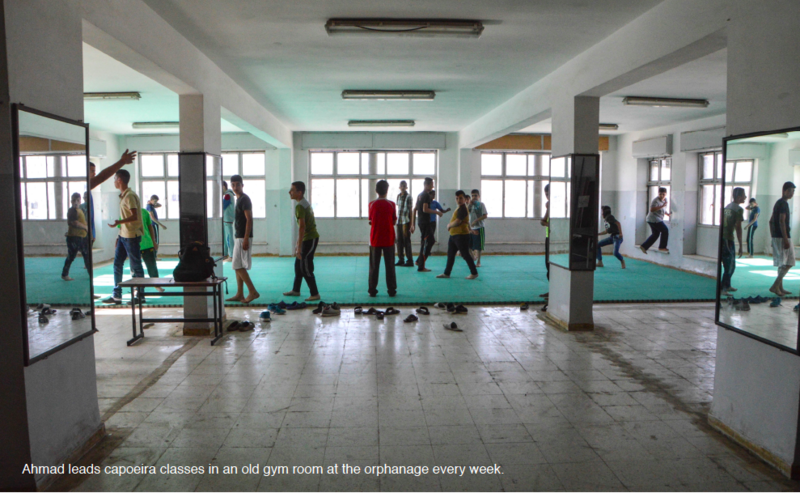 “That’s the school where I first learned capoeira!” Ahmad exclaimed. “It was a beautiful moment for me when I first started playing. We would come here at night to train, take the last bus that goes towards Shuafat, and walk the rest of the way home.” Ahmad said with a fondness for these past memories. “My friends eventually stopped playing, but I kept going,” Ahmad told me proudly. Playing capoeira in this context proves to be difficult for many Palestinian young men. “After turning 18, the boys would go to college if they can, where they usually stop playing capoeira. Family issues also cause them to stop because boys who cannot continue with their studies must work. Balancing work with capoeira is hard, really hard,” Ahmad spoke from firsthand experience. Ahmad himself started working part-time since he was 16. He now works fulltime as a waiter in a hotel six days a week, beginning his shift at six o’clock every morning. Despite a busy and demanding schedule, Ahmad dedicates his only day off to teach capoeira at Dar Aytam Sina’ia (Orphans Industrial School), an all-boys orphanage located in Bethany, West Bank. Dar Aytam Sina’ia is home to over 60 boys under the age of 17. “Not all of the boys’ parents are dead. Some of them are here because they have family issues at home,” Ahmad explained. As Ahmad and I walked across the brightly-lit hallway inside the orphanage, young boys eagerly sprinted to greet their teacher. Several boys also raced each other towards the cabinet to fetch the key for the room where capoeira classes are usually held. With the key in hand, the group of boys led the way, leaping up the stairs, giggling and shouting along the steps until we reached a large room located on the third floor of the building. Old gym equipment and machines lined up against both sides of the wall, and an open space with mats on the ground was situated towards the back of the room. Upon Ahmad’s call, twenty-five energetic young boys ages ten to sixteen pounced on the mat, barely able to contain their excitement and chatter. The energy in this classroom was unparalleled to any other groups of students I have visited in the past. As Ahmad had explained to me earlier, these boys do not have much to do in their free time, hence they are always full of pent-up energy. Throughout the next hour and a half, the boys continued to compete for Ahmad’s attention, often pulling on his sleeve and urging him to watch them demonstrate capoeira movements. Amidst the chaos, Ahmad gracefully moved across the room, from corner to corner, and corrected his students’ postures or movements. He also individually assisted newer students who were less coordinated, flexible, and confident about their bodies. I later learned from other students that Asla practices capoeira everyday and often teaches his friends along the way. As our car pulled away from the school’s parking lot after class, Ahmad’s students yelled from the open window above, urging him to stay. He chuckled, waved a goodbye and told them he would see them soon again. “These boys stayed in the orphanage for so long and can’t go out. This is really bad for them,” Ahmad said as we started our journey back to Jerusalem. “No dad and no mom… That’s really terrible. I keep coming back because of that. Bad people come from places like this where nobody tells them who they can become. As a result, They try to build something in life on their own having missed out on everything in life. But most of them get lost to drugs, crime, and end up in prison,” Ahmad observed with a sadness in his voice. Although the reality of life as a Palestinian is difficult beyond our imagination, Ahmad tries his best to see the current predicament with positivity and hope. “Capoeira makes you feel peaceful and energized. In capoeira, we teach our students that ‘we kick but we don’t hit each other.’ Why? Because the kids will apply the same logic in life when they do other things. They will always remember: ‘I will kick, but I will never hit.’ This is why I want everybody to play capoeira,” Ahmad expressed. Aside from working with boys who desperately need a role model in their lives, Ahmad also dreams of becoming a firefighter someday. “There are four Jewish fire stations and only one Arab one in Jerusalem,” Ahmad explained. “Firefighters work 48 hours and rest for the next 48 hours. I think this schedule will be good for me. I can also teach capoeira more often this way,” Ahmad calculated. So far, Ahmad has successfully passed the intensive physical exam required to become a firefighter. “The physical exam was very tough. On the first day, I ran two kilometers under seven minutes and did many pull-ups and sit-ups. On the second day, we did drills on the beach. All of my teammates stopped during a challenging exercise because they were too tired, but I kept running to the finish point carrying buckets of sand on a stretcher,” Ahmad beamed as he retold the story. Unfortunately, Ahmad was unable to pass the written exam. “The test was in Hebrew. I never studied words related to firefighting. I didn’t even know what the word ‘hose’ in Hebrew was!” Ahmad exclaimed with a burst of laughter. A hiccup, like many other challenges in Ahmad’s life, did not stop him from pursuing what he aspires. Like his early days in capoeira, Ahmad persevered even when his friends gave up after hitting a rough patch. As it turns out, nobody else was able to pass the written exam either. Rather than to sit and wait for something to change, Ahmad now volunteers in the fire station once a month on his holiday in hopes of earning an opportunity to officially join the team one day. Before gearing up to put out fires or rescue injured passengers from a car wreckage as a firefighter, Ahmad plans on continuing to help heal the invisible wounds of young Palestinian boys who might someday walk with greater confidence and resilience because a persistent teacher once showed them that they matter. “From 6am to 5pm? Just to get your Turkish ID?” I asked. Abdullah is a Syrian refugee who fled the war in his country to live in Istanbul, Turkey in 2016. “If I didn’t leave, the government would’ve taken me away to the army and sent me to fight in Aleppo, ” Abdullah said. Abdullah was born in Damascus in 2000 to his parents, the youngest of four older brothers. His father died when he was thirteen. Abdullah’s eldest brother moved to Iraq. His older set of twin brothers are still trapped in the Syrian army, and his other brother, who managed to flee the army to Turkey, recently left for France in search for asylum, leaving Abdullah and their mother behind. Everything went well for Abdullah in Syria before the war broke out in 2011. Two years into the war, their family received a mysterious knock on the door late at night. Before the family could respond, the door was kicked down, and Abdullah’s older twin brothers were both taken from their beds and sent to two separate army bases to fight for the Assad regime. “Before the war, Syrians had to fulfill two years of army service,” Abdullah told me. However, since the war started, soldiers like Abdullah’s twin brothers have been trapped in the army for more than two years due to the ‘current state of emergency’—as the government coins it. “My mom was scared that the government would come and take me away. I ran into soldiers on the streets and sometimes they demanded to know who I was, and why I wasn’t in the army. I always told them all four of my brothers were already serving in the army. You can’t take me, I need to go home and care for my mom,” Abdullah recalled. After three missiles were launched near his school compound in 2015, Abdullah was kept at home from school for almost a year. Soon after, one by one, Abdullah’s neighbors, boys his age, were forcefully conscripted into the Syrian army and sent to fight in Aleppo. “No one ever comes back alive from Aleppo,” Abdullah said solemnly. In order to prevent the government from taking her remaining boy away, his mother decided to bring him to Turkey where her older son, Othman, has resettled after deserting the Syrian army. To protect Othman and stop government officials from searching for the missing soldier, the family used to make up stories that he was killed in the war. Sadly, Abdullah’s challenges did not end here. Reality differs starkly from television, as he phrases it. When Abdullah and his mother first landed in the Istanbul Ataturk Airport, they found out all their baggage had gone missing. Othman, frustrated at the situation and poor service and attitude from the airline, began to raise his voice and concerns to the operational staff on the ground. “I had to hold Othman and tell him to calm down. He was so angry,” Abdullah said. Eventually, the airport security came out with tasers and threatened Othman to back down. The family went home that day and spent their first night in a new and foreign country with nothing but each other. The second time they returned to the airport in search for their bags (after a first failed attempt), they were shown into a room overflowing with more than 200 bags. “Look for your bags among the pile,” the airline staff barked. After a long search, they finally found their belongings. “What you see on TV makes you think Turkey is a paradise. . . We were lucky to come to Turkey, but we are sometimes treated like sheep here,” Abdullah said. Sheep—animals told where to lie, where to rest, where to eat, and where to sleep—was the metaphor Abdullah chose to describe his situation and that of many other Syrian refugees during our conversation. Abdullah’s airport incident is one among many inconveniences and maltreatment of Syrians in host countries around the world. 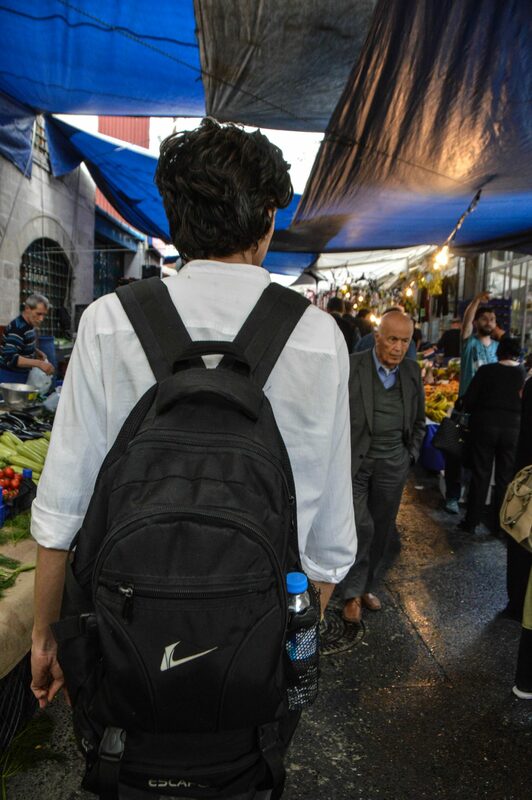 The reason Abdullah had to line up for hours with 3,000 other Syrians the day before we met was that the Turkish government had suddenly imposed a regulation that all Syrian students had to obtain an ID in order for their final high school examination to become fully officialised. Some of Abdullah’s friends did not have proper documents for the ID and will have to redo an entire year of schooling. “The police also waved their tasers at us at the centre, like we were sheep,” Abdullah recounted. A three-day final high school examination for Syrian refugees, which was originally scheduled to take place mid-June, was also rescheduled without warning over this past weekend. How many days did the Syrian students have to study for those exams as a result? “I just gave up,” Abdullah said, throwing both hands up in the air. How could he study for chemistry, physics, Turkish, English, mathematics, and other subjects in one day? Furthermore, Abdullah was recently asked to provide previous school records from Syria to complete his profile in the Turkish governmental database. “Where can I find these records?” Abdullah said skeptically. Despite the many challenges Abdullah faces daily as a refugee—minority, young, unemployed, and family scattered around the globe, he tries to do social good in the way he best knows how: by teaching capoeira to Syrian, Iraqi and Palestinian refugee children who have gone through similar experiences. As a young boy in Damascus, Abdullah learnt how to play capoeira from his older brothers. He fell in love with the sport the more he played it. “My brother used to train the advanced students in capoeira, and I would help by leading the beginners, in Raqqa,” Abdullah recalled. Raqqa is Syria’s northern province. “I looked like a baby back then, like a student,” Abdullah laughed as he pointed himself out of the crowd of people from the picture on his phone. All four of Abdullah’s older brothers along with their mother play the game of capoeira. For Abdullah, capoeira has become a symbol of family and community. Throughout our time together, Abdullah continued to show me numerous photos, videos, and interviews of capoeira classes in Damascus before the war. His excitement and pride of being a young capoerista in his then-peaceful country was radiant and inspiring. “You can see many Syrians living in this neighborhood,” Abdullah told me. In Istanbul, before Othman left for France, the two brothers teamed up and continued their work in Syria by teaching capoeira to refugee children in Small Projects Istanbul, a local community centre serving over 150 households. “Look for their headscarfs,” he continued. If there are patterns, those women are probably Turkish, but if they have a plain color, they are Syrians,” he explained. As we walked along the neighborhood, Abdullah pointed out all the Syrian stores and families along the way. We also stopped by a tuck shop ran by his student’s father to remind his students that capoeira class is starting soon. “Youssef, the kid at the shop, is my oldest student in class. He loves capoeira so much that he usually waits for me early before class starts since his father’s shop is located in the same neighborhood. Youssef has improved so much since he first came to class,” Abdullah said with a twinkle in his eye. “There were about six kids in our class when we first started last October,” Abdullah recalled. Now on average, ten to twelve boys and girls show up to Abdullah’s class each time. After Othman left for France, Abdullah decided to singlehandedly continue conducting capoeira classes, commuting two hours each way to and from the centre. When Abdullah and I first entered the centre for class this evening, three young boys shouted his name from a distance. They raced towards Abdullah, clung onto him, and fought for their teacher’s attention. Abdullah is really good with children. When class started, he quickly got their attention, organized them into lines, and began leading capoeira warm-up exercises in this tiny cramped room in the basement of an old building. Abdullah glanced over his shoulder at me with a grin while pointing out the newly added mats on the ground, a luxury that was not here during my visit last December. Joy and laughter soon erupted and filled the tiny space as the rain fell quietly outside. Ayah, a nine year-old student in Abdullah’s class beamed and told me. Not only does Abdullah manage to teach class once a week at the center, he has also recently added a second capoeira class to give his students another much-needed opportunity to engage in sports, music, and play. Abdullah wants to help boys and girls in his class to communicate more effectively with each other and to break down gender stereotypes. “When I was a kid in my country, they always separated boys and girls. The boys played on one street, and the girls played on another street. The first time I saw a capoeira roda in Damascus, I thought to myself: ‘Wow, what is this? The boys and girls were standing right next to and playing with each other.’ This idea grew within me, and now I want to do this with my students,” Abdullah explained. Since Abdullah has to go to school on Friday (Syrian students go during the weekend), he filed a request from his teachers to allow him to leave his last class early to arrive at the center on time for capoeira. “The principal’s assistant saw a video of me on the Internet teaching capoeira. So he told me it was okay to go early!” Abdullah proudly exclaimed. Aside from teaching capoeira, Abdullah hopes someday to become a computer engineer. Although the young man sitting across from me has gone through so much for his age, he still exhibits a childlike, curious, and fun spirit in a relaxed environment. “I love capoeira because it’s the one hour in which I can forget everything and play with kids,” Abdullah said. “What is one piece of advice you’d give to people who are interested in starting their own social capoeira projects?” I asked Abdullah. Without hesitation, Abdullah replied: “I will tell them to start now. You will feel passion and pride when you do it because not only will it make you feel better, but it will make the kids so happy. . . and the faces of the kids. . . their smiles. . ..” Abdullah trailed off as a smile spread across his face. We’re looking for the X-factor in our candidates. So, don’t worry if your application isn’t perfect. If you have Changemaker axê, we’ll find it, we won’t box it, and you could still make it onto the Programme. Note: C4R is looking to expand and broaden the Award to teachers who work with vulnerable children globally. You’ve made it this far, but have some questions and want to learn more about our Awards programme. Then read on for answers to some frequently asked questions that we hope provides the details you are looking for. Please also note that we will be giving webinars where we will provide a thorough overview of the programming history, purpose, process for applying, and answer any questions you still might have. Now onto the most popular questions and answers! Capoeira4Refugees works with refugee communities and particularly traumatised children and youth using the Brazilian art/sport of capoeira to bring psychosocial benefits such as increased self-respect and reduced levels of violence. Capoeira4Refugees was founded in 2007 working with street children in Syria. C4R has been active in the West Bank, Palestine since 2011, in Jordan since 2014 and helped projects to grow and to create structures of local ownership also outside the middle east. What is the Grassroots Awards Programme? The grassroots awards programme, which has been piloted since 2015, aims to support local impact projects with mentoring, training, financial support, and network referrals so they can continue, expand, and sustain their own social projects in their communities. The application is painless and straight forward, applicants will only need a smartphone in order to apply. We are using digital solutions to connect our Awardees directly to an ecosystem of support. Notice: we did not say, donors. We said the ecosystem of support. Because that is what the network is about. It is a Changemakers’ network where everyone involved is able to help. We have created a model of working with youth that leverages the power of the digital era to work meaningfully at a highly local level whilst achieving scale through a network. If the programme is for you – rest assured though, the application is being designed to be straightforward and simple, all you will need is a mobile phone, a paper, and a pencil. Watch the Introduction Video then complete our intake form (which you find below the video). We ask you to fill information about your project including your Project Milestones Overview (here is the video) with Arabic subtitles, history, the impact that you have had to date, your capacity, and your needs. Don’t worry if you aren’t able to fill everything out, just email us what you can and then we can arrange a time to speak over the phone to finalise the form. The process allows us to understand more about your project, how we can support, and to make sure you are the right fit. This also allows you to become eligible to apply to the Fellowship programme. Once your form is complete, we can add you to our hub and welcome you to the community! Stay tuned for more details and please see below for an overview on the application process! What is the next phase of the Awards Programme? Currently, we are reviewing the programme based on the learnings that we have collected from our current fellows. In phase 2, we will be relaunching the fellowship programme which will incorporate these learnings and feedback from Changemakers who took part in the pilot phase. The application process will open to apply. “What are we looking for in candidates? We look for passionate people who are active in using and promoting music, sport and play to support vulnerable children and youth around the world. 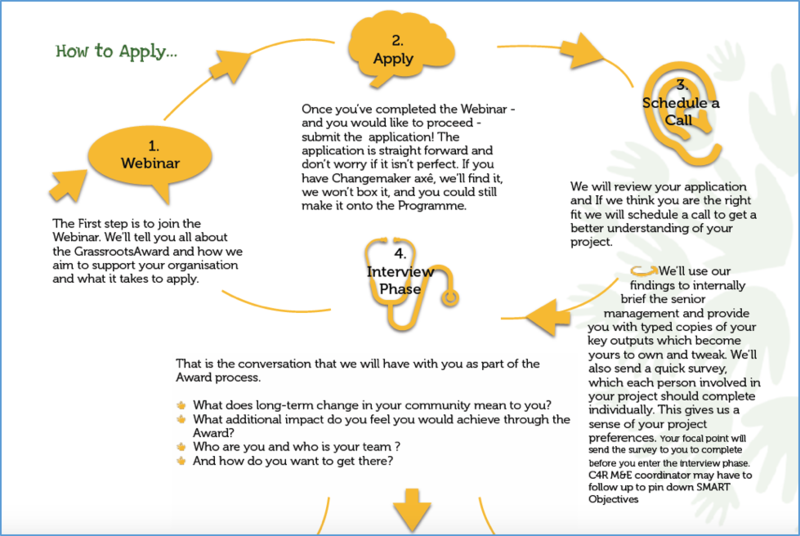 Your project and vision can be at any stage of development, but the important thing is that you are proactive, have a willingness to expand and grow your project, and be registered on the Changemakers hub (see below for more information). What are the types of profiles you look for? You have a great project and you need help to make it stand out and grow it in a gradual and slow manner. You have a good idea how to get there, you know you want to grow your project, but certain pieces are missing and you need support and advice. You know what you want, you already have concrete results and numbers and want to expand your project. 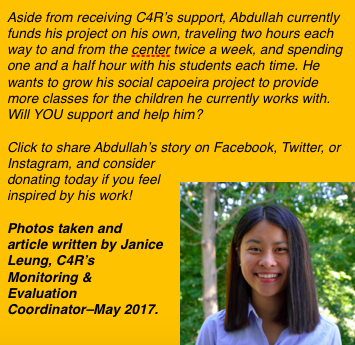 What support will C4R provide fellows? Showcasing and proving Impact (‘We’, C4R has developed a model ‘Most Significant Change’ with the East London University and you will use an App which works on/offline/GPS stamped) to share data. Other tools such as task management and, milestones etc. to better understand and support your project in real time. What will be expected of me as a fellow? We are here to support your own initiative, above all, we need you to be proactive and show initiative. Use our online apps including a GPS stamped and works on/offline to submit quantitative attendance data to keep track of the numbers of children who are being reached. Post compelling pictures and content on social media and tag C4R to help us promote the great work that you’re doing. Manage your project development through our shared project management tool and the (beta version) dashboard. Provide regular updates to our community and the C4R team. An understanding of that the support we give is outcome based and can vary from month to month on your engagement and our funding situation. Lastly, the above-generated information goes directly to your page which we will share with our network to get more support. Ideally, long term but the length of the partnership is very much depending on regular updates, using the tools we provide and the relationship we will create. What is the Capoeira Global Hub? 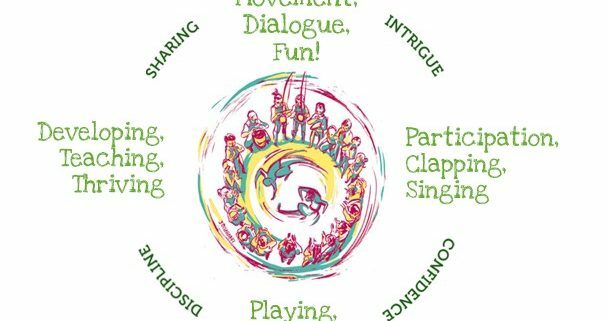 Another core area of C4R’s strategic project is the Capoeira Global Hub, which is an online networking and resource sharing space that amplifies the impact of capoeira social projects globally. Why is the Capoeira4Refugees launching the Capoeira Global Hub? We have been running social capoeira projects since 2007, and in that time, we’ve reached over 60,000 children. To really scale our work, we need to partner, and support other individual and groups with their work also. Together we can reach millions of vulnerable children worldwide. To be able to do this we need a platform that connects people and allows capoeira players to share information and leverage resources together. Through the Hub we will also increase the credibility of capoeira as a tool for development, especially in the sport for development sector, helping to raise funds and support for capoeira projects around the world. The space created for dialogue and intercultural understanding will also support communities in helping to create inroads to rebuilding societies torn apart by conflict. The Capoeira Hub is informed by Capoeira4Refugees learnings from working for over ten years in war zones. By creating a collaborative space where ideas, best practice and knowledge can be shared we strengthen projects using capoeira across the globe. How does the capoeira global hub help people and organisations running capoeira social projects? We are developing a number of different resources that will help promote and support projects. This includes the first database of social projects using capoeira. This database will help connect projects to research opportunities, practical cooperation and funding opportunities between different organisations, media opportunities, volunteer and other resource support. Based on our initial pilot phase of launching the database we have already had successes in the above-mentioned areas. We are also sharing key resources that can help people running capoeira social projects to better understand how to develop their work. This includes materials on monitoring and evaluation, how to work with vulnerable communities, how to maintain and build capoeira instruments. These resources are delivered through a range of mediums including video, powerpoint and online real-time calls. 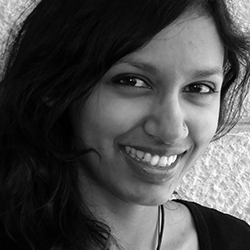 What benefits can I expect when I add my project to the changemaker’s hub? What are the expectations if my project joins the hub? C4R intake form – a C4R team member will use this form to collect key information about your project, scope, capacity, needs, and vision, after which we will share it with you and add it to our site. Bio and photos – We request a bio and photos showcasing your work that we can add to your profile on the Changemakers hub. Keep us updated – To ensure that we have consistently updated information, we ask that you keep us updated on any changes to your organisation and profile.